Lotus has introduced an expanded Evora GT430 line-up designed to appeal to those who want the ultimate in high performance sports cars. Following the debut of the Lotus Evora GT430, Lotus has introduced an expanded Evora GT430 line-up. Designed to appeal to a wider range of customers who want the ultimate in high performance sports cars. Adding to the acclaimed Evora 400 and Evora Sport 410 models, the new Evora GT430 range now includes two body options and a choice transmission. Joining the recently announced Evora GT430 is the Evora GT430 Sport. A new member of the family that carries the same phenomenal firepower and sculptured body-style but without the additional downforce-creating aerodynamic elements. Both models are powered by the same 3.5-litre V6 supercharged and charge cooled engine, producing 430 hp and 440 Nm of torque (Automatic version: 450 Nm). The new series production Exige Cup 430 is Lotus’ wildest incarnation of its point-to-point two-seater sports car. New to the Exige, the Cup 430 sees the introduction of a savage, high-performance engine installation. Mated to a new supercharger and chargecooler, designed specifically for the unique demands of this vehicle. A development of the powertrain recently used on the phenomenal Lotus Evora GT430. Perfectly paired with a newly-designed body, which delivers enhanced aerodynamic performance to reveal the model’s true potential. The result is a strikingly different beast of pure performance, that’s not for the faint of heart. 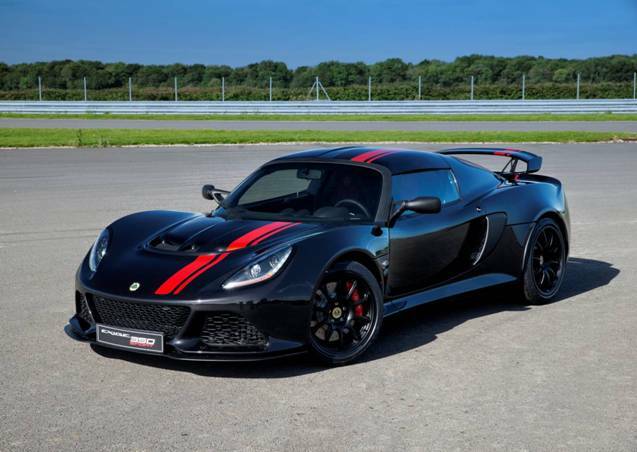 Saving the hardest until last, the new Lotus Exige 350 Special Edition is a fitting completion to the trilogy of Lotus 50th celebration editions. Based on the most extreme Exige to date, the Sport 350, the new special edition adds a number of lightweight, performance-enhancing features, as well as unique paint and interior options as standard. The new Lotus Evora 400 is the latest pure and focused supercar from Lotus, combining high performance with the legendary Lotus benchmark handling. It is faster and dynamically more capable than the previous Lotus Evora leading to greater agility and a more involving drive. Maximum speed is 186 mph (300 km/h) and acceleration 0-60 mph is just 4.1 seconds (0-100 km/h in 4.2 seconds). This enables the new Lotus Evora 400 to lap the challenging test track at the Lotus Headquarters in Hethel, Norfolk, a scintillating SIX seconds faster than the previous model.